Down 13-10 in the first quarter of Game 2 in the opening series of the playoffs, the Grizzlies finally went to the much anticipated double team of Kawhi Leonard. They corralled him just past half court near the sideline, nobody flashed middle for the Spurs and as Leonard tried to call a timeout, he was called out of bounds. This seemed to ignite Kawhi, and on the very next offensive possession he drove right down the middle and hit a floater over Marc Gasol. This started a 43-20 run that put the Spurs up 56-30. But through that stretch, the Grizzlies primarily used Vince Carter and Wayne Selden on Leonard without doubling. That strategy has no chance of working. 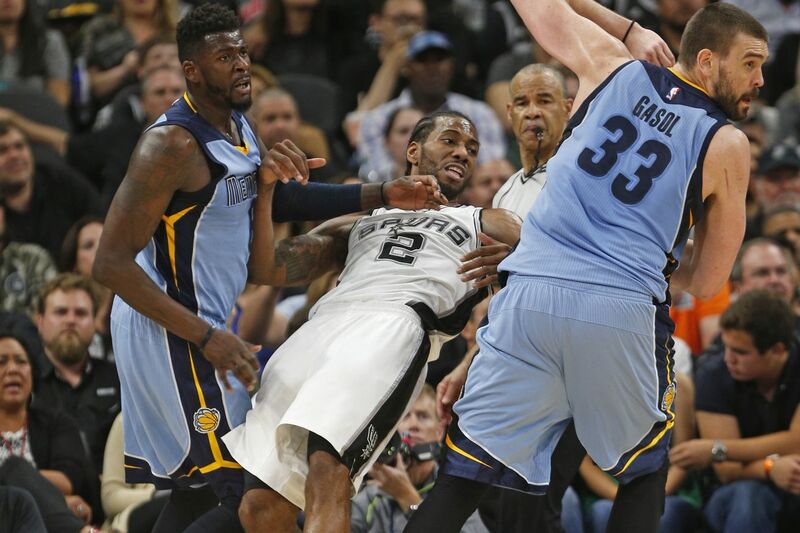 Conversely, with James Ennis III and Zach Randolph in the game, the Grizzlies fared much better against The Klaw. Ennis was a plus five, and helped force Kawhi into four turnovers to just two assists. Had Fizdale gone to him earlier and mixed in a few more double teams, the Grizzlies might not have found themselves looking up from the bottom of a 26-point hole. But Ennis did his part, and helped the Grizzlies cut the lead to four points with ten minutes left in the fourth. He’s someone to watch as this series moves forward. Pau releases from his screen and gets into the middle of the floor. Kawhi moves the ball to him quickly, setting up a four-on-three. Tony Parker and Manu Ginobili are positioned in the corners, with Aldridge open on the wings. Aldridge and Ginobili are good 3-point shooters at 39 and 41 percent respectively, but Memphis decided they had to force someone besides Leonard to shoot. Parker was just a 33 percent 3-point shooter on the year, and despite hitting shots thus far in the playoffs, you have to give up something when you double. Pause the video at the three second mark. Randolph, Ennis and Andrew Harrison are all in the paint, ready for the Gasol drive and conceding the 3-pointer. Pau takes one dribble and fakes the pass to Aldridge to freeze Randolph. He then briefly turns his body back towards the basket and whips a pass to Parker before he bumps into Harrison. Parker catches and knocks down the corner three. Gasol was close to being whistled for an offensive foul, but Harrison’s heels are in the restricted circle. Unless the Grizzlies fell asleep, this play was telling. The Grizzlies first priority was Kawhi, followed by Gasol. They were going to live with Parker, Aldridge or Ginobili shooting. Parker was 3 of 5 on the night from long range, but that’s not something the Spurs can bank on every game. Ginobili was 0 of 3 and Aldridge is still hesitant to shoot 3-pointers. Moving forward, the Grizzlies may try to bait these three into shots and double Kawhi more. It likely won’t matter in this series, but as the playoffs progress, especially when Dedmon and Parker are on the floor, the Spurs should expect teams to throw junk defenses at Leonard, much like the pre-Durant Warriors saw against Steph Curry. Ultimately, the Warriors found an antidote through Draymond Green’s passing to a plethora of shooters. Gasol can definitely play that pressure release role. He’s a great passer and shot 54 percent from three this year. The question is, if teams double Kawhi, then sell out on Gasol, can Tony Parker and the supporting cast knock down open threes consistently enough to punish the strategy? They’ve made them all year, but the playoffs are a new season, and they’ll need Green and Parker to stay hot, and Mills and Ginobili to shoot better in order to beat Houston or Golden State.